We ask that all campers bring a sack lunch each day and a refillable water bottle. Please also be sure to send a snack and drink for mid-morning. We will be sure to keep any refrigerated items in our refrigerator. Proper riding attire is always appreciated. Campers may wear shorts, but must bring long pants to change into for riding. Only sturdy closed toe boots or shoes may be worn the entire time at the facility. Please no sandals or flip flops! 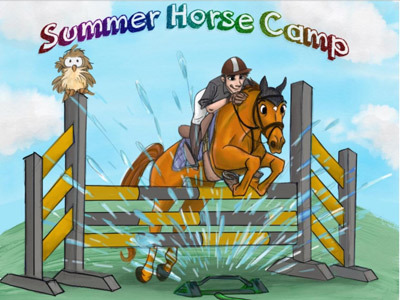 Helmets are provided unless the camper brings their own approved equestrian helmet. At the end of the week, your child will have an opportunity to show you what he/she has learned in their very own Horse Show! We hope you will be able to make it as I’m sure it will make you very proud. Our Summer Camp will be held from 9:00 AM to 1:00 PM. The pricing for the 5 days is $350/camper and we are looking to have a lot of fun! There will be no camp held during the week of the 4th of July. To register for camp, please call 770-516-9735 or swing by the farm to register in person.